Gridsmart Modules - J.O. Herbert Co., Inc.
From a single actuated intersection or highway counting station, to the largest coordinated systems, GRIDSMART’s state-of-the-art equipment and intuitive software performs the same whether you need one camera or one thousand. GridSmart supports independently licensed software modules to flexibly meet your various requirements. The different GridSmart Modules can be enabled independently on each and every GridSmart Processor, maximizing value and delivering one simple solution for diverse needs. The Counts Module unlocks access to at least 1 full year of historical traffic data. With the Realtime Data Module, the GridSmart Processor provides minute-by-minute performance data for the last hour. The Alerts Module enables a connected GridSmart Processor to send email on user-configured sites or zone events. The GRIDSMART System actuates intersections and gathers important traffic data to adjust signal timing and traffic flow strategies. 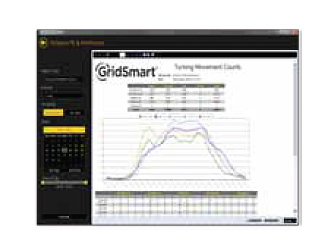 GRIDSMART enables real-time remote monitoring and visual assessment.